Often we gather inspiration from conversation and visual elements, however music and sound can also be very inspirational. The music created for this album is designed to allow you to 'switch off' all the information and images we are bombarded with on a daily basis and relax with a clear mind. The calming, tranquil audio is created with an 'air' about it, taking the listener to a higher level allowing the focus of particular goals. 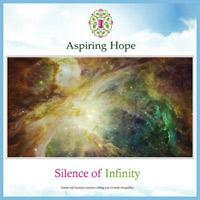 This featured album ‘Silence of Infinity’ is an audio only CD, with music composed to deliver a calm atmosphere, giving way to positive thought and inspiration for better things. Many use this audio as a motivational aid for clearing thoughts and focusing on specific tasks.